ama-Ambush is involved in the development of African music on the marimbas. The group provides marimba teachers to schools, manufactures and supplies marimba instruments, and operates a number of performing marimba groups. ama-Ambush's vision is to provide South African youth with opportunities to play African music. Through these opportunities they will create an African music identity for themselves, their school, their community and their country, South Africa - bringing an "Africanness" to schools and society across the cultural spectrum.In amaAmbush we pride ourselves in our punctuality and professionalism. 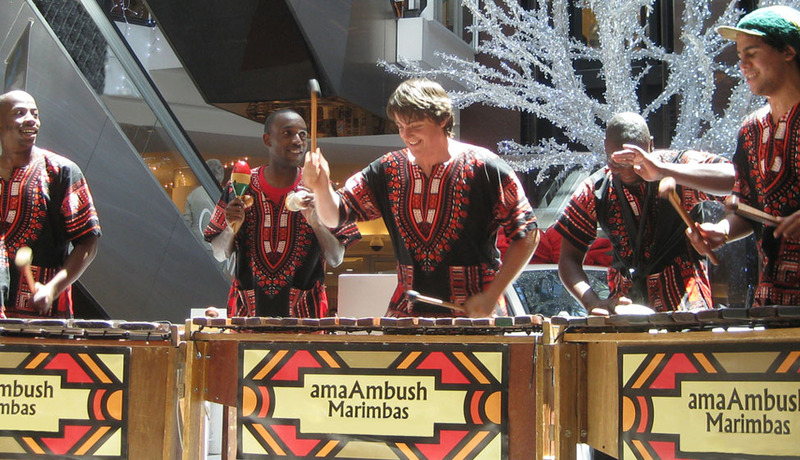 ama-Ambush is a popular marimba band led by Ross Johnson who has combined his Western music training with his African music experience, to create an energetic catchy sound that encourages listeners to "join in". 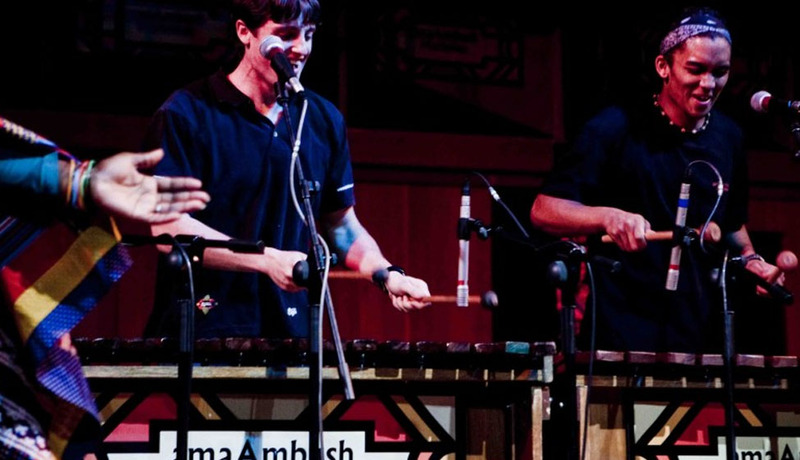 ama-Ambush seeks to develop the marimba music culture so that it becomes an identifiable part of being a South African. Due to the increasing popularity of the group, they have received widespread media coverage, with radio interviews being aired on Cape Talk, Fine Music Radio, CCFM and UCT Radio. In addition, feature articles have been published in prominent local newspapers. Toward the end of 2006 Ross Johnson presented a workshop on the African Marimba in Kuala Lumpur, Malaysia. The group is an ideal addition to an event. They are able to provide quiet background atmospheric music or an energetic feature performance. Their repertoire ranges from popular African tunes such as Miriam Makeba’s Click Song and Pata Pata to traditional material such as Amapondo’s 9:15 and Uzuko Inyama. ama-Ambush have their own compositions which are fast gaining popularity, such as "No More Tears" and "Kyle’s Song". Ross Johnson is the founder of the group amaAmbush. He was first introduced to African music, as a young boy, learning the African penny whistle on the streets of Cape Town. He has a degree in music from the University of Cape Town, and works as the Managing Director of amaAmbush Productions. He leads the group, and plays the alto marimba. Kyle Williams is studying a Bachelor of Business Science degree at UCT. He comes from a very musical family and started playing in his school marimba band at the age of 13. Kyle has composed popular amaAmbush tunes such as Kyle's song, and Kryptonite. Zama Qambi has been a full-time musician and dancer since 2001 when he studied dance at UCT. He first learnt to play the djembe (African drum) as a young boy. Zama provides the drum rhythms and vocals for amaAmbush. Thulani Bukani is studying a Bachelor of Engineering degree at Cape Tech. He was part of the St Josephs Marist College marimba group with Kyle. ama-Ambush is a professional marimba band that was formed in 2002 by Ross Johnson. The band’s high energy performances have put them in a class of their own – which was confirmed when they were awarded first prize at the 2006 National Marimba Festival in Johannesburg. The 5-piece band has over 600 live performances to their credit. Recent performances include their CD launch at the Baxter Theatre in Cape Town, a performance with the Soweto String Quartet, and a show onboard the Queen Elizabeth II (QE2). Other clients include Sasol, Media 24, Pick ‘n Pay, the Department of Education, the Department of Arts and Culture, the University of Cape Town and the University of the Western Cape.